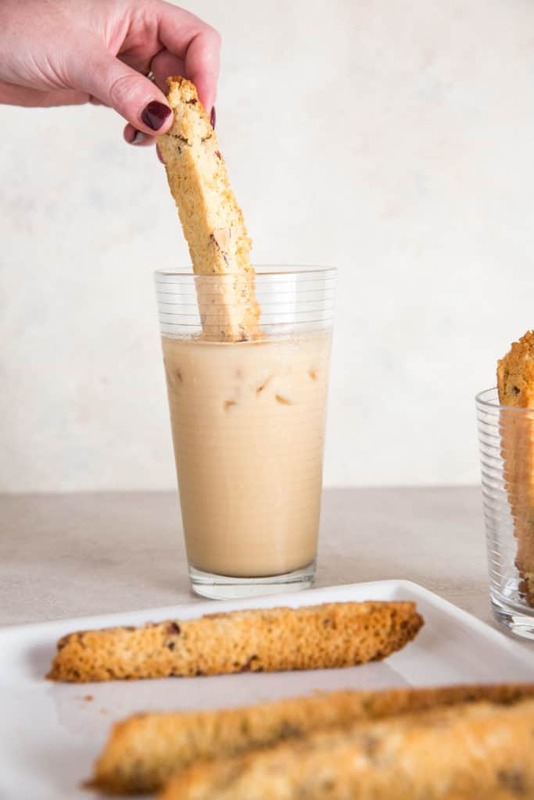 Biscotti has always been one of Matt's favorite foods to eat alongside his coffee. Growing up in an Italian household has made some parts of keto difficult, this being one of them. So, of course, we had to make a Keto Bsicotti for all you Italians lovers of food! This is a recipe for the books - make it in bulk because it will go quick. nor should it be! As Matt stated in the video, biscotti means twice baked. This recipe will take some well deserved time, but will leave you with a dessert that is almost indistinguishable from the real thing! 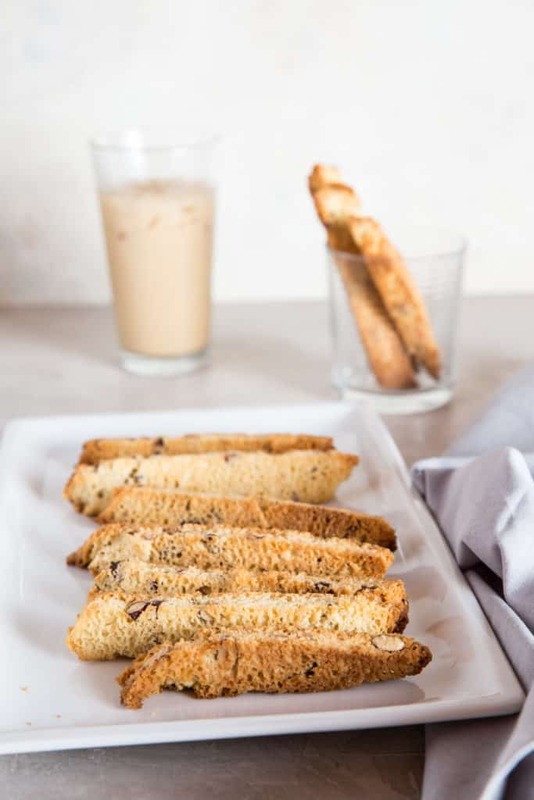 Toasting the almonds, allowing the biscotti to cool properly and baking it twice are all essential steps to making the perfect keto biscotti. That being said you can always make one of our quick keto desserts, aka mug cakes while you wait for these heavenly biscottis to cool! Our favorites are our pumpkin mug cake (perfect for the holiday season) and our cinnamon mug cake also available in our Fat Bomb Bible! Keto Almond Flour Cookies For The Win! Almond flour makes some of the best keto cookies out there! Recently. I found out I was misdiagnosed one and a half years ago with a tree nut allergy. I had been missing out on some of my favorite cookies, from our chewy chocolate chip cookies, to our pecan shortbread cookies and even our low carb snicker-doodles! You better believe I will be making all three of those this holiday season. 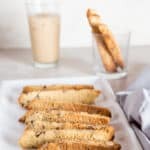 Recipe can be quickly added to MyFitnessPal - Search "KetoConnect - Keto Biscotti"
Preheat the oven to 350F. Line a large baking tray with parchment paper or a silpat liner. Spread almonds on a baking sheet and toast in oven for about 10-12 minutes. When baked, remove from oven, chop, and set aside. In a medium bowl, whisk together the almond flour, flaxseed, coconut flour, baking powder, salt, and erythritol. In a separate bowl, whisk eggs, stevia, melted butter and extract using a hand mixer. Add in the dry mixture and combine until fully incorporated. Fold in cooled, chopped almonds. Allow batter to sit for 5 minutes (to allow to coconut flour to absorb some of the moisture). Divide dough into half. Place halves side by side on a large cookie sheet, leaving a few inches between (dough will spread out when cooked). Form each half into a log shape. Bake for approximately 30 minutes or until golden brown in color and firm. Let cool for 20 minutes. Using a serrated knife, cut into ½-inch thick slices. Place cookies, cut side down, on the baking sheet and bake for another 15 - 20 minutes. Be careful when you are moving the cut cookies to the cookie sheet because they break easily. Remove from oven and cool on the baking sheet for 10 minutes, then move to a wire rack to cool completely. The longer they cool the crispier they will get. Best stored in an air tight zip top bag on your counter top. Enjoy!